On July 26, 1945, the heavy cruiser USS Indianapolis (CA-35) completed a dangerous and secret mission from the U.S. mainland to Tinian Island to deliver atomic bomb components that would later be used on Hiroshima. In the middle of the night on July 29-30 on the way to Leyte in the Philippines, Indianapolis lost 879 men when Japanese submarine I-58 launched six torpedoes and sank the ship. Many crewmen perished in the shark-infested waters as no rescue came until a search plane discovered them three and a half days after the sinking. Only 317 men, including the ship's captain Charles McVay, survived the ordeal. In December 1945 after the war's end, Captain McVay faced a court martial trial on two charges: (1) hazarding the ship by failing to zigzag as an evasive maneuver from torpedoes launched by a submarine and (2) failure to abandon ship in a timely manner. He was convicted on the first charge despite testimony by Captain Hashimoto of Japanese submarine I-58 who said that the six torpedoes would have hit Indianapolis even if she had been zigzagging since his submarine was so close. McVay committed suicide in 1968, and Congress in 2000 passed a bill, signed by President Clinton, to exonerate him posthumously for the loss of USS Indianapolis. 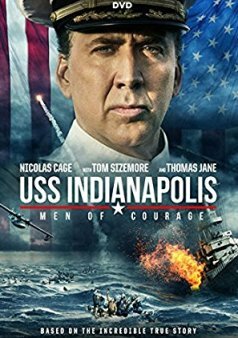 Although this movie follows the basic historical facts related to USS Indianapolis from kamikaze attacks off Okinawa on March 31, 1945, to the court martial of Captain McVay in December, it has many flaws. The dialogue and computer animation lack realism, and the crewmember subplots, not based on history, add little to the overall story. The film's presentation makes it difficult for viewers to become emotionally involved with the characters, even though Indianapolis crewmen suffered greatly as they waited to be found and tried to avoid being eaten by sharks. There are several references and discussions about sharks even before Indianapolis arrives at Tinian with her secret cargo, which takes away from surprise when the sharks first appear. Lieutenant Standish, a character invented for the movie, is the officer that the crewmen hate, but his exaggerated statements, such as bragging in front of the crew that he graduated first in his class, do not make him a believable character. The kaiten human torpedo, which carried out suicide attacks against American ships from November 1944 until the end of the war, plays a key role in this movie. On the way from Pearl Harbor to Tinian, Captain McVay expresses that he does not believe that a zigzag course, a common defensive measure to avoid torpedoes launched from submarines, will be effective against a kaiten weapon since the pilot can steer the torpedo in response to changes in the ship's course. This statement somewhat exaggerates the effectiveness of the kaiten, since the pilot needed to employ a periscope in order to view the target ship. Using the periscope greatly increased the kaiten's risk of detection and subsequent countermeasures by the ship. McVay in the movie mentions none of this. At the court martial trial shown in the film, McVay states that he did not think zigzagging was effective in a kaiten attack, but he says nothing about torpedoes, which were used to sink Indianapolis. The opening scene depicts rather unconvincing Japanese kamikaze planes, which are diving at Indianapolis. Captain McVay himself unrealistically directs the huge ship's gunners as to exactly when to fire at attacking aircraft. One kamikaze plane coming in from the port side hits the side of the cruiser at the bow with an impact that seems would cause little damage. It is mentioned later back in San Francisco while Indianapolis is undergoing repairs that nine men had died when a Zero fighter hit the ship. What really happened during the kamikaze attack near Okinawa on March 31, 1945, was an Army Hayabusa (Oscar) fighter (Nakajima Ki-43) made a run at the starboard side and passed over most of the cruiser before crashing near the port side of the ship. The Japanese pilot released a bomb that penetrated several decks and caused casualties and heavy damage to the ship . The difference between us and them is that we want to do our duty and then go home. The man who flew his kamikaze plane into the bow of our ship knew he wasn't going home. He was on a suicide mission, using his body as ammunition. God help all of us when we face an enemy like that. Before Japanese submarine I-58 encountered Indianapolis, the movie presents a scene where the submarine fires one kaiten toward a sighted ship while patrolling the Philippine Sea on July 19, 1945. The kaiten misses what the I-58 captain concludes was only a merchant ship. In actual history, on July 28, 1945, I-58 launched two kaiten toward a large oiler. About fifty minutes after the launch of the first kaiten, I-58 picked up an explosion, and ten minutes after that I-58 heard another explosion. The submarine surfaced, but nothing could be determined due to a squall that obscured visibility . In this first kaiten attack by I-58, the film unnecessarily tries to deceive the viewer that Indianapolis is under attack, since the screen flashes back and forth between I-58's launching of the kaiten and a drill being carried out by Indianapolis crewmen, even though at this date Indianapolis and I-58 are a great distance from each other. When I-58's Captain Hashimoto sighted Indianapolis the night of July 29-30, he had the kaiten ready to launch but decided not to do so after the salvo of six torpedoes hit the ship. 1. Morison 2001, 138; Rielly 2010, 204. Hashimoto, Mochitsura. 1954. Sunk! New York: Henry Holt and Company. Morison, Samuel Eliot. 2001. Victory in the Pacific, 1945. Originally published in 1960 by Little, Brown & Company. Edison, NJ: Castle Books.